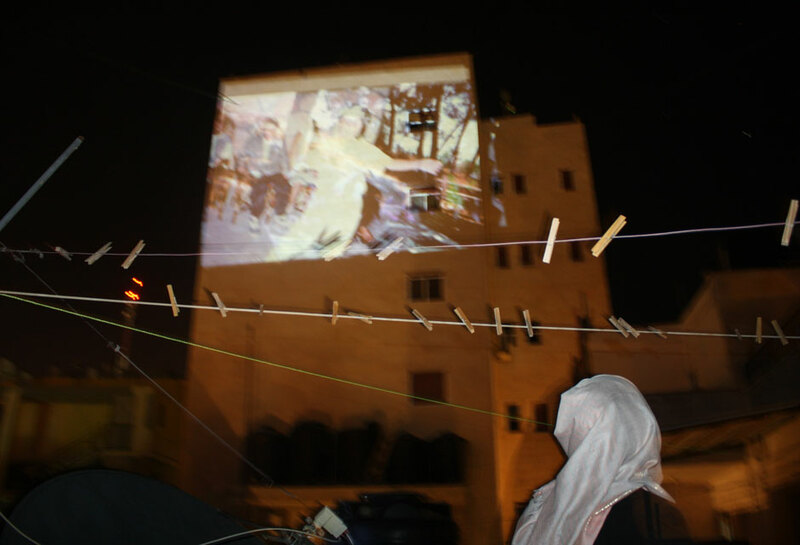 Projection of archival family photographs in Dheisheh Refugee Camp in Palestine. Photo documentation by Moyad Al Qasy. Courtesy the artist and Campus in Camps. In collaboration with Campus in Camps (DAAR), Dheisheh Refugee Camp, Palestine. Contributors: Loay Abu Aker, Wad Alfararjah, Ayed Arafah, Hamza Daghash, Moayed Al Qaisy. Families’ residents in Palestinian Refugee Camps are the direct testimonies of the transformative process of the everyday in the camps. The private familial space conserves an iconographic repertoire of photographic documents of the everyday in form of family albums or printed snapshots. The latters are the shared moments of events, celebrations, political gatherings which today exists alongside the digital snapshots of mobile phones and the narrative of social networks. The nature of the printed images implies that they are privately shared and narrated and not publicly commented. These moments of sharing become one of the few settings where the private manifest itself in the overcrowded and permeable spaces of the refugee camps. Memory assumes an individual form in the camps, without losing the context of the collective political voice. To preserve becomes an act of concealment in the camp when these photographs are threatened by the Israeli’s armies irruptions, which practice, after the usual irruption and violation into private spaces in the camp, is to erase the photographs, an act that can be translated in the intention of occulting the existing and transmittable memory of an entire community.